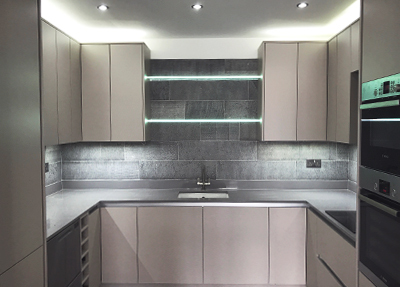 So, you’ve made the choice about your kitchen cupboards, your worktop surface and even which kind of taps to go for. Now it’s the big one though – will you opt for gas or electricity when it comes to cooking? • The type of hob our grandmother and great grandmother’s used, the gas hob offers instant, controllable heat and is easy to use (it’s just a matter of pressing the ignition and turning a knob). • They come in glass and steel varieties (glass being more expensive but steel is more expensive to keep clean). • Newer gas cookers, fitted with an optimal burner, are more energy-saving because they heat the ring vertically rather than horizontally meaning there’s no wasted flame. This can cut as much as 10 per cent from your cooking bill. • The pan rests can make cleaning the surface of the cooker difficult regardless of whether your cooker is steel or glass. If an unexpected gust of wind rushes through the kitchen and extinguishes the flame a good quality hob recognises this and turns off the gas. • These days your electric hob will either be a ceramic or an induction version. Both look very neat in any kitchen and are simple to keep clean, thanks to their flat surface area. • If there are children in the house then electric is certainly the safest form of hob thanks to the fact that modern cookers don’t switch on unless a certain sequence of buttons is pressed. They also light up to show ‘hot’ spots. • Ceramic hobs aren’t expensive compared to induction hobs but they can be slow to heat up. They heat up the whole ring too which means if a pan spills over then you’ll get burnt food on the cooker top. • Induction hobs are very contemporary design-wise and extremely quick to heat food. That’s because the ‘magnetism’ involved heats the pot rather than the hob top. This also makes it extremely energy efficient and safe. • It’s also possible to gradually increase the heat on an induction hob. • The negative is the expense as well as the fact you have to use pans comprising ferrous metal for the magnetism to work. • pop up extractors or ceiling mounted Ines can be used for kitchen islands. • These days it’s possible to buy a Zoneless induction hob. With one of these you can lay your pot anywhere on the surface and the hob will detect it and heat only that pot. If you’ve reached this far and still can’t make up your mind, worry not; it’s possible to have a combination of both ie a single large gas ring beside a few induction zones. 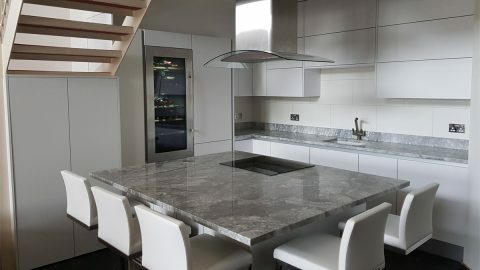 If you’re considering investing in a new kitchen and design and would like more information or advice then contact us here at londonkitchendesigner or call us on 0208 504 8850. We’d be happy to chat! Can you Handle a Handle-less Kitchen? 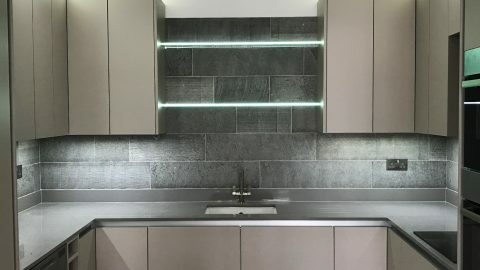 If you want a superb fitted kitchen , check out my reviews, just google Rated People kitchenprojectdesign Which is my old website check out numbers the same as this new website.